Let’s begin this week’s review with something quite amazing. It comes from the Hambletonian Trail blog, where we covered and won both of the soph trots offered at the Meadowlands on July 12. Shake It Cerry, the filly we have been applauding at two and now at three, was our choice in the Del Miller Memorial. We assumed she would be the choice of most bettors and perhaps a prohibitive favorite. Wrong! Shake It Cerry went off and won at an astounding 7-2 ($9.60, $4.60, $2.60). Our second choice followed her over the wire at 5-2—Heaven’s Door ($4, $2.40) completed an exacta worth $30.80, also a terrific gift. Everyone was on board for the soph-colt trot winner, Father Patrick ($2.80, $2.20, $2.10), in the Stanley Dancer. No exotics here, as both of our possible exacta partners broke and were eliminated from competition. We share the results of our soph-trot analysis’ here with our weekly update. The Hambletonian Trail comes to you in cooperation with TwinSpires and the Hambletonian Society. You can read the recap race stories and data on the history of the August classics at the society’s archives. It is less than a month away until Hambletonian day. We hope to be at the Meadowlands for the spectacular program and the first Hambo at the new facility. Also in the winning column, we had a mild victory with the frosh stakes as Artspeck won a colt pace ($3.40, $2.80, $2.40). Stepping back a moment to July 11 at Mohawk, We gave you the chalk in a Maple Leaf Trot elim and it won—Sebastian K ($2.10 n/p n/s wagering). The exacta was playable, however, and our second choice, Creatine completed the $6.60 combo. Back to Saturday, we pick up the pieces in the stakes at the Meadowlands. 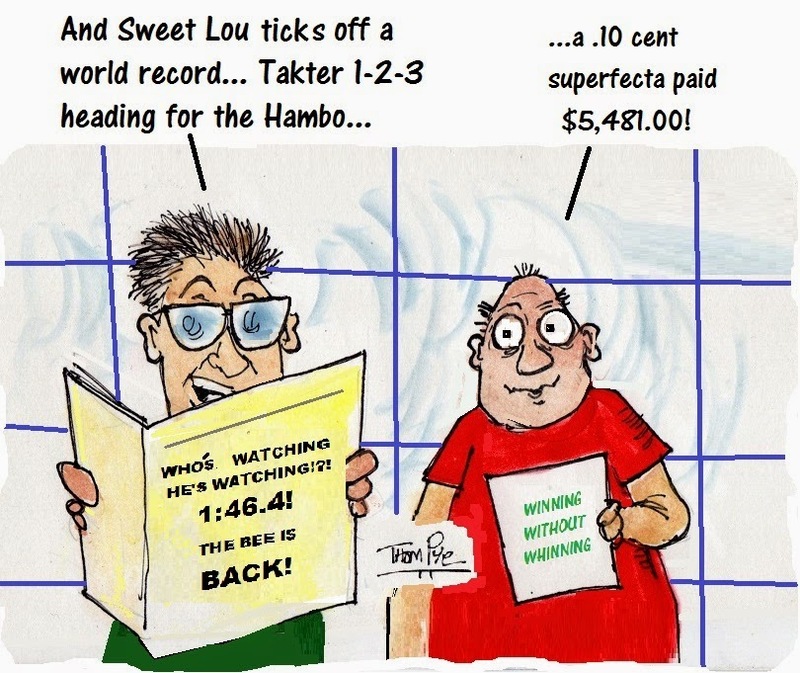 We cannot report success with the big feature of the weekend because Hes Watching won the Meadowlands Pace, finally gaining respect from his doubters, of which we were some. Our third choice, Always Be Miki, came in second ($5.80, $4.60). The race went as we suggested it might, however, Hes Watching was in the spot where we suspected our choice, JK Endofanera would be in late stretch. The “Pace” did look a lot like the North America Cup, especially with another one of our choices, Lyonssomewhere, soaring to the lead as he did in the “Cup” and cutting breakneck fractions—:25.3, :53.2, 1:20.3. “JK” was first over into the speedy turn of the mid two panels, and it was Hes Watching that zoomed off the pace late to win (1:46.2). The top three finishers were fifth, ninth and sixth, respectively, in the first quarter. Hes Watching was the second choice at 2-1. In the ad hoc Pace consolation, we were third with Brioni ($6.20). In the “Haughton,” Captaintreacherous was third ($3), ruining our boxed exacta and the probable winner, Sweet Lou, won ($4, $3, $2.40). The only other pay horse was in the Miss Versatility, as Bee A Magician won as the public heroine and our choice, D’Orsay finished third ($10.20). Speaking of huge place and show prices, peruse the horses-to-watch (H2W) list below, where our live contenders rolled out some big numbers across the board. There are no typos in the prices! Sportswriter was never a huge favorite of this department at two and did not impress us as he was promoted to be a division leader at three, even though he went zooming to win the North America Cup. But when he lost the Meadowlands Pace in a terrible performance we were convinced he would never be as sharp as Rock N Roll Heaven, who we rightfully made king of the division in 2010 and covered as he scourged the group all the way through the Breeders Crown finals. Giving the devil his due, though, Sportswriter’s first crop (he stands in Canada) has hit the track with speed and success. Sportswriter was best at two, so it remains to be seen if his progeny can maintain their frosh shines as sophomores. On July 11, Sportswriter’s frosh fillies won all three divisions of the Ontario Sires Stakes (ONSS) Gold Series at Mohawk. Southwind Mischief (1:54), trained by Casie Coleman, who was also Sportswriter’s conditioner, won the first $70,000 split; Blake MacIntosh’s Sports Chic took the second (1:54.2); and Pop Writer (1:54.3) won the third for trainer Tony Alagna. We’ll be keeping an eye on the stallion’s average earnings and his colts in ONSS action and how they fare among all North American babies. Foiled Again will try for his third win in the Battle of Lake Erie when the event is presented on July 19 at Northfield Park. The sport’s highest earner, now 10, should face familiar foes, also nominated—Bolt The Duer, Clear Vision, Heston Blue Chip and Michaels Power to name four. Foiled Again won the event in 2009 and 2011. He is trained by Ron Burke and won over $6.3 million. We’ll analyze the race in our July 17 blog. Kawartha Downs will celebrates its 42nd anniversary on July 19, featuring the $12,500 Billyjojimbob Memorial Trot. The program will include 12 races with 25 percent higher purses than on a regular race card. The Billyjojimbob Memorial Trot celebrates a great trotter who began his career at Kawartha and went on to become the only Canadian horse to win the prestigious Elitlopp in Sweden in addition to the Breeders Crown. Contemporary mare pacing great and World Champion Miss Easy is dead at 26. Miss Easy was a $30,000 a yearling broken and trained by Bruce Nickells. In 1990 she was voted frosh pacing filly of the year. She won 15 of 17 starts and earned more than $1 million. In 1991, she was voted soph pacing filly of the year. She won 10 of 15 starts, earned $648,700 and concluded her racing career with earnings of more than $1.7 million. Unfortunately her racing success did not translate in the breeding shed. As a broodmare she did not produce quality racehorses. Her lack of production found her being offered for sale in 2002 as a barren broodmare. Jim Simpson, Dr. Bridgette Jablonsky and Murray Brown of Hanover Shoe Farms decided Hanover would purchase her and she would be guaranteed a home as a retired mare. As fate would have it, when booking season came along Dr. Jablonsky suggested that Miss Easy be booked along with the rest of Hanover’s active mares and she subsequently produced eight foals for Hanover, bringing a total of $220,500. She never became a great producer but she spent her remaining years enjoying the good life that she had earned and deserved. Miss Easy was laid to rest in the farm's cemetery opposite its main entrance. John Gilmour, 76, a Monticello Raceway mainstay horseman for more than 47 years, is dead. Mr. Gilmour’s record speaks for itself. It spanned six decades, in which he earned 4,492 winners as a driver in years when the racing seasons were short and driving at two tracks in one day wasn’t an option. John was one of the famous Gilmour brothers, William (Buddy), George and Lloyd, who together accounted for more than 14,250 driving victories. For John, Monticello had been home since the early 1960s although he began his career at Buffalo Raceway and Batavia Downs, two tracks near his hometown of Lucan, Ontario. The article is very important. It's great to read about the success of someone. I would like to think if I could have done a good thing myself. One day you can do good things if you try not to make mistakes. Thanks for sharing this article among us. SameDayPapers is our company name, if you want to get some valuable writing services anytime you may visit our website. It's very helpful for you. Compared to other Writing Services sites, our site is very important, Writing services are provided by keeping the linguistic aspects in easy and beautiful way, you can visit the site once you want to verify. Thanks!